Cataracts are one of the most common eye conditions, and they are the leading cause of blindness. 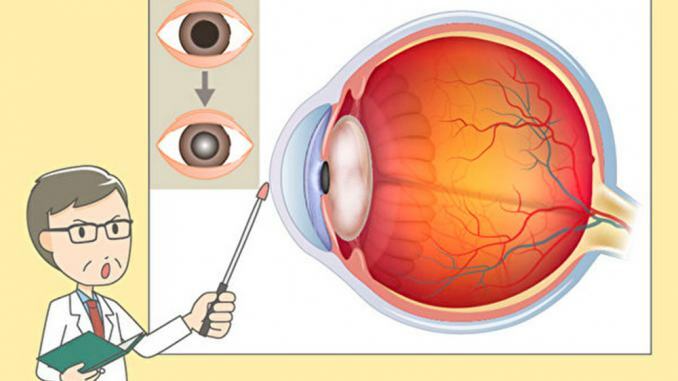 According to research, cataracts account for 41 percent of blindness cases, and 49 percent of low vision cases. In the elderly (age greater than 60), this number jumps to 73 percent. Cataracts take many months or even years to form, and are more commonly seen in those above the age of 50. In the early stages, the eyes are never red, swollen or painful. Instead, one may only notice slightly blurry vision, or see shadows in the form of dots, lines or discs in one’s vision. One may also see halos, or have poorer vision in bright light. They may also have trouble with distant vision. On examination, the pupils will still react normally to light. Initially, if the cataract starts forming on the peripheries of the lens, one’s vision will still be relatively good and a detailed examination of the back of the eyeball will be normal. As the disease progresses, the lens will develop grey-white matter that floats to the top. When a strong light is shone on the eye, a yellow crescent shape thrown by the iris can be seen on the lens. In the final stages, the lens is completely opaque and white, and the yellow crescent shape can no longer be seen. Studies have shown that electromagnetic radiation at almost any wavelength can damage the lens. The damage from electromagnetic radiation is cumulative. The lens is highly sensitive to thermal damage from microwave radiation, and long-term, low-dose exposure to microwave irradiation is potentially more dangerous than short-term, high-dose exposure. Long-term chronic ultraviolet radiation can also accelerate the formation of nuclear cataracts. Multiple studies have shown that smoking can increase the risk of cataracts, as cigarette smoke contains substances that destroy antioxidants in the body and alter the proteins forming the lens. This leads to the formation of nuclear or posterior capsule cataracts. Researchers have found that patients with cataracts are more likely to have high blood pressure, or hypertension. However, the real cause of the cataracts might not simply be the hypertension, but could also be caused by some anti-hypertensive medications like diuretics. In addition, hypertension and the hardening of blood vessels can lead to impaired blood circulation. This can affect the quality of the aqueous humour (the fluid that fills the eyeball) which supplies the lens with nutrients, indirectly causing cataracts. The poorer one’s blood sugar control is, the higher one’s risk of developing cataracts. Corticosteroids can cause the formation of posterior capsule cataracts. Studies have found that areas with longer hours of sunshine have higher incidence rates of cataracts than those with shorter hours. The incidence rate decreases with latitude and increases with altitude. In other words, cataracts are more common closer to the equator and in mountainous areas. Genetics, alcohol, low protein intake, anemia, decreased lung capacity, and so on have also been linked to increased rates of cataracts. According to traditional Chinese medicine (TCM), the causes of cataracts can be divided into two major categories: excesses or deficiencies. Excesses are mainly in the form of too much liver heat and fire, or too much spleen and stomach dampness. Deficiencies are in the form of deficient liver and kidneys, or a weak spleen and stomach. The golden window for TCM treatment of cataracts is during the early to mid-stages. Age-related cataracts should be managed early with targeted external treatments or medications based on syndrome differentiation, so as to slow disease progression. In the later stages – or when the cataract has matured – medications are no longer as effective, but at this stage the cataract is more easily removed through surgery. These herbs have immunity-boosting, anti-aging and antioxidant effects. They include: astragalus root (huang qi), codonopsis root (dang shen), white atractylodes (bai zhu), poria (fu ling), processed rehmannia root (shu di huang), polygonum multiflorum (he shou wu), herba ecliptae (han lian cao), privet fruit (nv zhen zi), wolfberry (gou ju zi), Chinese dodder seed (tu si zi), paper mulberry fruit (zhu shi zi), and herba cistanche (rou cong rong). These herbs open blood vessels and promote circulation. Common herbs include: angelica root (dang gui), red peony root (chi shao), chuan xiong root, peach seed (tao ren), safflower (hong hua), dan shen root, suberect spatholobus stem (ji xue teng), luffa gourd (si gua luo), olibanum (ru xiang), myrrha (mo yao), and motherwort fruit (chong wei zi). These herbs have anti-inflammatory and softening properties, and also eradicate stasis to promote the absorption of the cataract. Common herbs include: seaweed (hai zao), kelp (kun bu), chicken gizzard membrane (ji nei jin), rice grain sprouts (gu ya), and malt (mai ya). These herbs improve vision and control cataract progression. Common herbs include: puncturevine caltrop fruit (bai ji li), common scouring rush herb (mu zei cao), pale butterflybush flower (mi meng hua), feather cockscomb seed (qing xiang zi), cassia seed (jue ming zi), and buerger pipewort flower (gu jing cao). Most people believe that mature cataracts can only be treated with surgery. I once saw a female patient in her fifties, who had severe right eye cataract. Her pupil was completely white and she could not see anything. As she was about to move to Italy for half a year, I taught her some simple eye exercises and advised her to do them frequently. After half a year, her right eye cataract had completely disappeared – even the eye specialists in Italy could not believe it! This patient was very intelligent and diligent; while overseas she modified the eye exercises I had taught her, which yielded even better results. 1. Close your eyes and roll them in a clockwise direction 14 times. Then, roll them anti-clockwise 14 times. 3. With your index fingers, press gently along the lower eyelid margin from the inner corner to the outer corner of the eye. Repeat three times. 4. With your index finger, press gently along the upper eyelid margin from the inner corner to the outer corner of the eye. Repeat three times. 5. With your index finger and middle finger, gently massage along the upper end of the eyebrow (the brow ridge) from inside to out. Repeat 14 times. 6. With your index finger and middle finger, gently massage the middle of the eyebrow in a down-to-up direction. Repeat 14 times. 7. With your index finger, massage the soft depression at the bottom of the lower eyelid (the chengqi meridian承泣穴) 14 times. 8. With your thumb, massage the space between the inner corner of your eye and the inner end of your eyebrow (between the qingming meridian 晴明穴 and the zanzhu meridian 攒竹穴) 14 times. 9. Using your index finger and middle finger, massage the outer corner of your eye (the tongzi liao meridian 瞳子髎穴) and the outer corner of your eyebrow (the si zhu cong meridian 丝竹空穴) at the same time. Repeat 14 times. 10. With your thumb, massage the nape of your neck (the feng ci meridian 风池穴) 14 times. 11. Run all 10 fingers from front to back through your hair 14 times. These exercises should be done once upon waking in the morning, and once before bed at night. If you have time to do them more often, the results will be better. The important thing to note about eye exercises is that one must persevere in them in order to see results. Dr Wu is the director of the Xin Yi Tang Chinese Medicine Clinic in Taipei, Taiwan.